Long Slim Cayenne. Long red, very wrinkled, green to red fruits about 6" x3.4". Thin flesh used for pickling or drying. 3500-5000 Scovilles. Pepper pungency is about 10 times greater after drying. 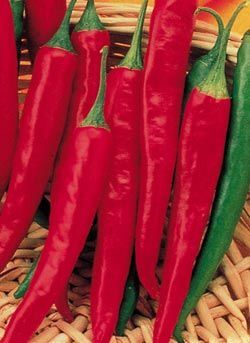 Also, peppers grown under stress and/or high heat and humidity will also be hotter than hot peppers grown under moderate climatic conditions. 200 or more total 48 ct flats of assorted varieties delivered or picked up at one time less 5% off the total.